Conceived, engineered, and built for one purpose – to help Ford regain its early dominance in the wildly popular SCCA Trans-Am racing series – the 1970 Ford Mustang Boss 302 remains one of the finest and most collectible products to arise from Ford’s “Total Performance” era of the ’60s and ‘70s. It is also one of the most satisfying Mustangs to drive, with balanced driving dynamics and excellent handling to match its high-winding 302 cubic-inch V-8 engine. With Ford struggling to make the Tunnel Port 302 racing engine work properly and the Roger Penske/Mark Donohue Chevy Camaro Z/28 juggernaut taking the Trans-Am title in 1968, the Ford camp acutely understood that something new was clearly required for success in 1969. The Mustang was faltering on the showroom floor to boot, with Chevy’s new highly engineered Z/28 Camaro package quickly gaining the favor of streetwise buyers. Ford’s two-pronged counterattack was based on a new Mustang variant designed to homologate an all-new engine design for Trans-Am competition combining a high-strength 302 engine block and internals with the big port, canted-valve cylinder heads from the new 335-series “Cleveland” V-8. A hot solid-lifter camshaft, large four-barrel carburetor, stout Toploader four-speed transmission, and other excellent goodies from Ford’s parts bin rounded out the new Boss 302 package. Suspension development was largely ignored until former key GM executive “Bunkie” Knudsen and former GM designer Larry Shinoda, of Corvette Stingray fame, stepped in. Acutely aware of the relentless development that made Chevy’s Z/28 classic car so successful on both the street and racetrack, they championed comprehensive suspension and aerodynamic tweaks to create the best-handling American car available. Shinoda also eliminated a number of tacky add-ons proposed for the new Mustang, replacing them with a simple flat-black hood, side stripes, spoilers, and optional rear-window louvers. He also contributed the car’s “Boss” moniker – meaning “the best” – in tribute to Knudsen, who was known simply as “the Boss”. Track-bound Boss 302s were built at Kar Kraft in Brighton, Michigan, and campaigned by teams fielded by Bud Moore and Shelby. While the Trans-Am championship proved elusive for 1969, success was finally achieved in 1970. 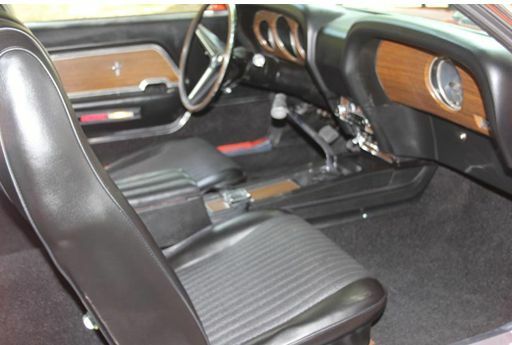 Unlike many racing homologation specials, the Boss 302 was profitable for Ford and according to experts, a little over 7,600 examples were built in total for 1969 and 1970. Freshly repainted in Calypso Coral, the quality of the restoration on this Boss is outstanding. The floor pans are painted the correct red oxide primer and all the factory inspection marks have been painstakingly duplicated. The details under the hood are simply outstanding, with the clean 302 V-8 and 4-speed manual transmission, traction-lok differential and 3.91 axle making for a smooth performing classic. 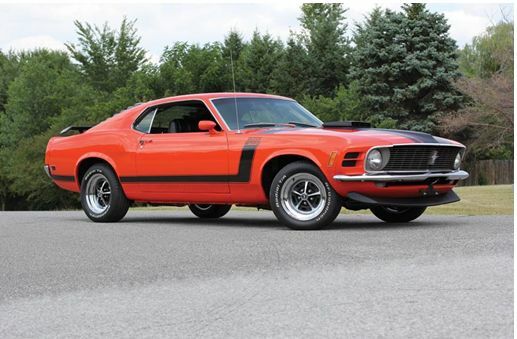 Today, all surviving Boss 302s are highly coveted, valuable, and thrilling in every respect. I work a number of collector car auctions. I was recently at the Barrett-Jackson Auction in Las Vegas. Going to a car auction is a learning opportunity for me. I always start by walking through and looking the cars over. 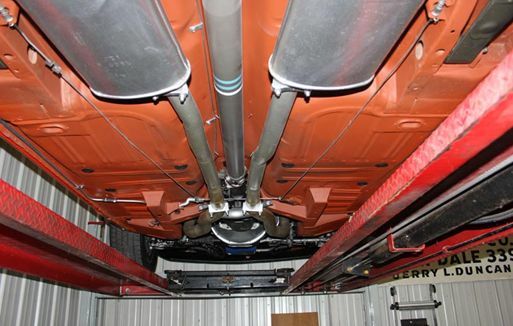 If a collector car sold for lower than what you thought it should, there’s a good reason why. Sometimes you’ll encounter a bidding duel on the auction floor between two people that absolutely must have the car, which will build up the cost above average, but that is only on occasion. Every once in a while a car will sell for lower than you would have estimated because the bidder that may have wanted that particular car was not at the auction that day to make a bid. 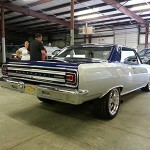 For example, there’s a Ford collector vehicle for auction, and every person in the audience is a Chevy fan, besides you. So, hypothetically, they will not be bidding on the Ford. It takes two people to up the bid price, so if you are the only Ford fan, you’re going to be able to acquire that car for less than you anticipated because no one else will be battling you for the collector car. Watching the auctions on television can be entertaining, but nothing compares to actually being at the auction, looking at all the beautiful cars up close and watching them cross the block. If you have never been to a collector car auction, it is time to put that on your bucket list! Fuel — Fill up your gas tank and mix fuel stabilizer in with the gas. Run or drive the car with the fuel stabilizer until it is up to temperature. This way the stabilized fuel has been distributed throughout your entire fuel system. Tires — Check your tire pressure. 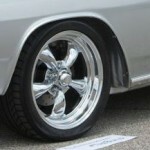 Treat the tires on both the outside and the inside of your classic vehicle to prevent the tires from drying out. Jack up the car and put it on jack stands to avoid flat spots on the tires. Paint — Protect your car from small scratches by applying a good coat of wax before you cover it up. Interior — Detail the interior so you start off the next season with a clean car. Treat the leather, vinyl, and dash. Battery — Use a battery tender. Even if it holds a charge through the winter, if you do not use a battery tender, it will shorten the life of your battery significantly. Garage Area — Moisture is your enemy. Make sure the car is stored in a dry environment. A dehumidifier in the garage helps. Also, the heat from a light bulb or the air movement of a very small fan under the car will help reduce the moisture build up under the cover. Always use a breathable car cover to allow moisture to escape. Chevrolet first applied the Bel Air nameplate to their premium line of sedans and hardtops in 1950. They pioneered a line of practical, well-equipped vehicles that would go on to become a huge part of Chevrolet’s success in the 50’s. 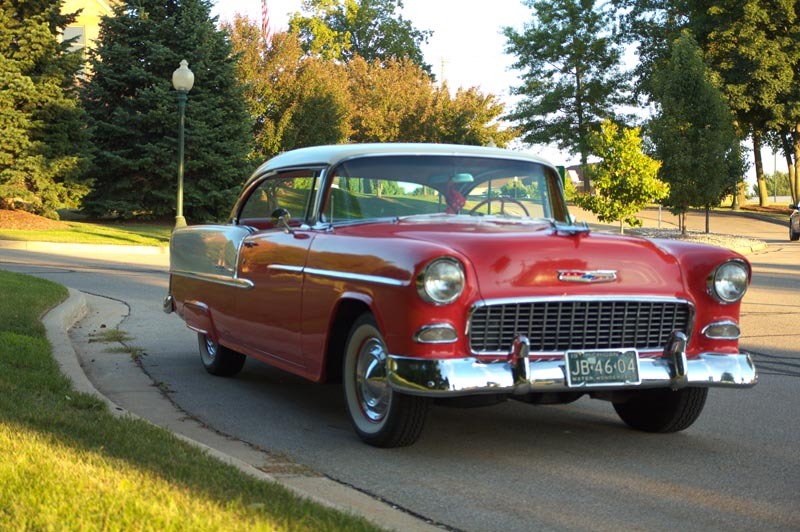 Today, all of the “Tri-Five” Chevys are highly sought after – and none more than the 1955 Chevrolet Bel Air. 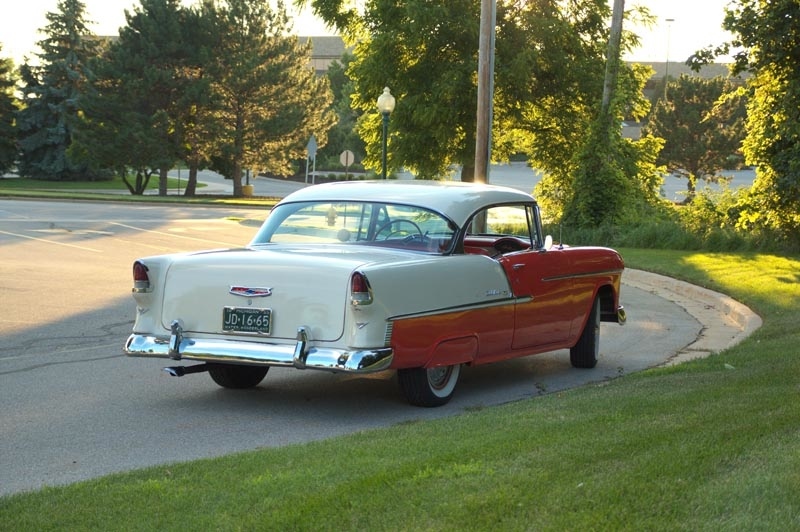 For 1955, Chevrolet‘s full-size model received all new styling and power. It was called the “Hot One” in GM’s advertising campaign. Chevrolet’s styling was crisp, clean and incorporated a Ferrari-inspired grille. 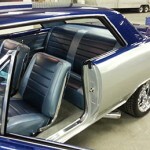 Bel Airs came with features never found on cars in the lower models ranges, such as interior carpet, chrome headliner bands on hardtops, chrome spears on front fenders, stainless steel window moldings, and full wheel covers. With it’s lower, wider body and wrap-around windshield, it was America’s most popular car in 1955, and remains a collectible icon with undeniable appeal today. Under the hood, the 1955 Chevrolet Bel Air gained a V8 engine option that would go on to define Chevrolet for many years. The new 265 cu in (4,340 cc) V8 featured a modern, overhead valve high compression head, aluminum pistons, and a long stroke design that was so good, it remained in production in various forms for decades. It was smooth, powerful, and easy to service, and the venerable “small-block” remains a legendary design. 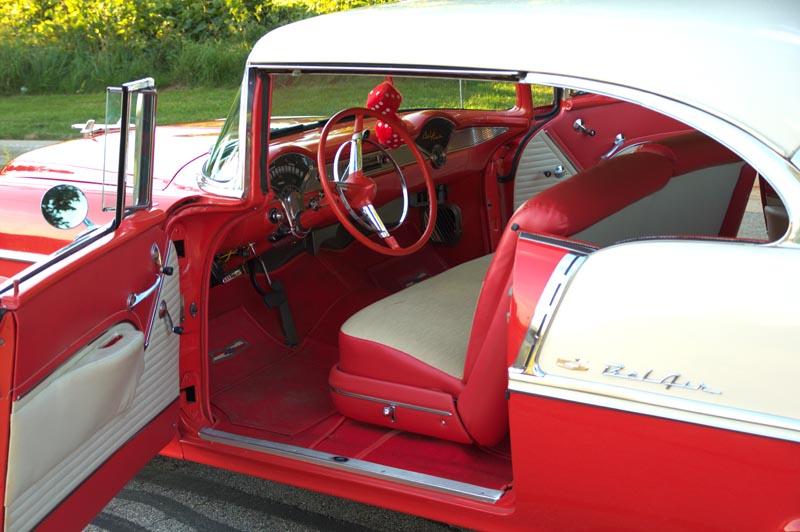 Mated to an updated wider chassis with ball-joint front suspension, open “Hotchkiss” drive, and tubeless tires as standard equipment, the exciting Bel Air was a hit right from the start. With modern styling, new-found power, and a popular price-point, the design team at Chevrolet definitely hit a home run. 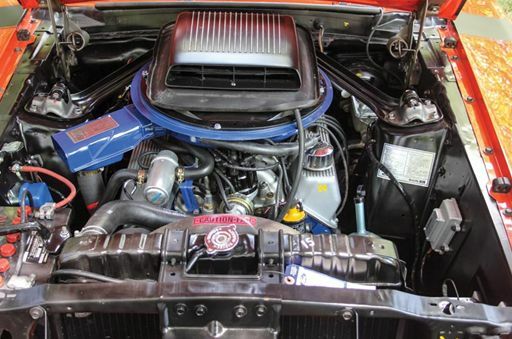 “Tri-Five” Chevrolets with a V-8 and Powerglide automatic transmission have proven to be smooth, reliable performers, and this car is no exception. It reaches highway speeds with ease, rides smoothly, and with it’s eye-catching two-tone paint and tons of chrome, they make a wonderful addition to any collection of 50’s cars.